For those who just can’t wait until fall to get their hands on a copy of the brand-new 2020 Ford Mustang Shelby GT500—the most potent production version ever in the history of the iconic pony car—renowned American tuner Roush Performance has just released its latest interpretation of a madly powerful Mustang. While the former promises to deliver more than 700 horsepower (the official number has yet to be announced), the 2019 Roush Performance Mustang Stage 3 packs no fewer than 710 ponies thanks to the addition of a Roush TVS R2650 supercharger to the regular Mustang GT’s 5.0-litre V8 engine. Torque is bumped to 610 pound-feet. We don’t know exactly how fast this thing is since the company provided no details about performance, but with similar output to the new Shelby GT500, which can reach 100 km/h in around 3.5 seconds and complete the quarter-mile in less than 11 seconds according to Ford, we should expect nothing less. And Roush made no mention of a speed limit, unlike the Shelby GT500 which will be electronically governed at 290 km/h. Click on the link to find out why. An available 3-way adjustable coilover suspension system can be installed to help deliver outstanding corner-carving ability. 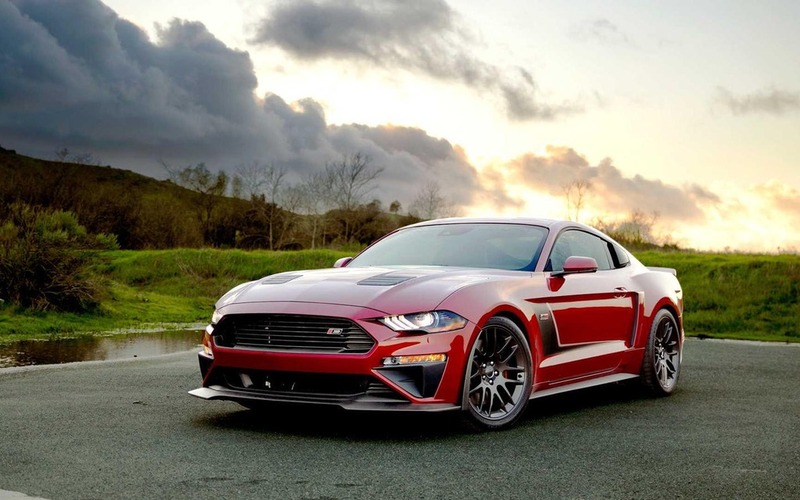 The Race Red 2019 Roush Performance Mustang Stage 3 further stands out with a chin spoiler, a high-flow grille, new air intakes, a distinctive hood with air vents, optional 20-inch black sport wheels, custom side skirts, a unique rear spoiler and special badging. It also benefits from an active exhaust system that offers four different exhaust settings. One of them is a Custom mode allowing owners to fine-tune the soundtrack of the supercharged V8. Starting at $21,925 USD above the base car, the Roush Performance Ford Mustang Stage 3 will be on display at the 2019 New York Auto Show next week, so don’t miss our coverage for additional pictures. At the event, we’ll also get to marvel at a lifted Roush Ford F-150 pickup (see photo gallery) that rides on an upgraded Roush/Fox 2.0 suspension with a two-inch lift at the front while adding an active exhaust system and a few cosmetic upgrades.